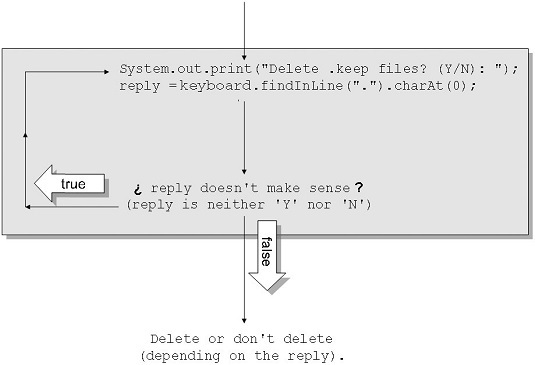 To write the Java program you see below, you need a loop — a loop that repeatedly asks the user whether the importantData.txt file should be deleted. The loop continues to ask until the user gives a meaningful response. The loop tests its condition at the end of each iteration, after each of the user’s responses. Here we go loop, do loop. That’s why the program has a do loop (also known as a do … while loop). With a do loop, the program jumps right in, executes some statements, and then checks a condition. If the condition is true, the program goes back to the top of the loop for another go-around. If the condition is false, the computer leaves the loop (and jumps to whatever code comes immediately after the loop). Writing the Condition at the end of the loop reminds the programmer that the computer executes the Statements inside the loop first. After the computer executes the Statements, the computer goes on to check the Condition. If the Condition is true, the computer goes back for another iteration of the Statements. This code displays Are you kidding? 2+2 doesn't equal 5 …and so on and then tests the condition twoPlusTwo == 5. Because twoPlusTwo == 5 is false, the computer doesn’t go back for another iteration. Instead, the computer jumps to whatever code comes immediately after the loop. In a do statement, repeatedly read numbers from the keyboard. Display each number back to the user on the screen. After displaying a number, ask whether the user wants to continue entering numbers. When the user replies with the letter n, stop. In a do statement, repeatedly read int values from the keyboard and keep track of the running total. The user says, “I want to stop entering values” by typing one final int value — the value 0. At that point, the program displays the total of all values that the user entered.